Comparisons to This Is Spinal Tap are being made left and right when reviewers are talking about Popstar: Never Stop Never Stopping. I can definitely see why, because after all both are comedies styled as music documentaries that take a hilarious swipe at the music industry from the vantage point of dim-witted musicians. However, while This Is Spinal Tap remains a unique comedy classic in its own right, Popstar: Never Stop Never Stopping is probably the closest that a film of its kind has gotten to recapturing that magic for a new audience, at a time when the state of the music industry needs a good ribbing more than ever. It makes sense, then, that this comes from the minds of The Lonely Island – consisting of Andy Samberg, Akiva Schaffer and Jorma Taccone – who have already proven to have the appropriate skills and levels of talent to satirise current music trends while also producing strong content in and of itself. Like Christopher Guest et al beforehand, the trio seems to know exactly who their targets are and what type of message they want to convey through their trademark style of humour. Not only do they do it effectively, making this one of the funniest films of the summer, but also in a way that shows their unconditional appreciation for the industry at the same time as their constant poking fun of it. The mockumentary follows the life of rapper Conner4Real (Samberg), who after departing from his rap group The Style Boyz which also consisted of Lawrence (Schaffer) and Owen (Taccone), embarks on an ultra-successful solo career, which brings him fame, fortune, and a whole load of brown-nosing entourage members (watch out for ex-Inbetweener James Buckley as one of those yes men). However, all that is threatened when Conner4Real’s sophomore album turns out to be a massive flop – a Rolling Stone review gives it, out of a five-star system, the poop emoji – and he desperately struggles to keep in the spotlight by any means necessary – except for actually reuniting with The Style Boyz, something that apparently everyone wants to happen. Even so, that might also be difficult, since a bitter Lawrence has retired from the business to become a farmer, and Owen is now acting as Conner4Real’s DJ, which basically consists of him pressing play on an old-generation iPod at concerts. The movie has a lot to say about the current state of the music industry, specifically about how it seems to have become more about the larger-than-life egos of the artists than the actual music itself. Conner4Real partakes in several narcissistic acts like posting vain posts onto social media – for instance, he uploads 8-second daily YouTube videos to notify followers detailing minor things he has done, from eating an apple to masturbating – and organising several publicity stunts like a disastrous proposal to his girlfriend (Imogen Poots), which involves a ravenous pack of wolves and the singer Seal. Yet, he rarely seems to put much thought or effort into writing good material to perform, or maybe that’s because he’s not very good at song-writing altogether – he claims to have written all the songs on his doomed new album, including a song called “Equal Rights” in which he strongly reinforces his heterosexuality while he’s singing about gay marriage, which are all perceived in the film as being unholy abominations of God. It offers a fun bit of commentary about the nature of ego and pride presiding over actual talent, and I found each single attempt for the character to remain relevant both hilarious but also remarkably on-point when you consider all the attention-grabbing things most celebrities tend to do nowadays. The Lonely Island has always been so good at poking fun of current musical trends, while also showing a genuine affection towards the industry as a whole, and Popstar: Never Stop Never Stopping allows them to sign their mad love letter with a series of squiggly lines. As well as acting, writing and directing, the trio have also contributed an entire soundtrack of new material, with many of them retaining that surreal and satirical edge while also surprisingly working as their own thing. Standouts include an opening rendition of the extremely catchy “I’m So Humble”, with a special appearance by Adam Levine’s hologram (“So expensive!,” Conner4Real boasts), the “Equal Rights” song mentioned earlier that also has the most hilariously edited music video, and “Finest Girl” which details a lover’s increasingly barmy fetish to be made love to in a style similar to the 2011 assassination of Osama Bin Laden. They each have their own musical style that fits right into modern techno or pop trends, but are also hilarious enough to stand on its own as a great song, and it would be rather awesome if at least one of those songs ended up on Oscar’s Original Song shortlist next year (it probably won’t happen, but if Sam Smith or Three Six Mafia can win an Oscar, then surely the Lonely Island boys have a shot?). Hilarious, on-target and clearly in love with the very thing it’s satirising, Popstar: Never Stop Never Stopping is a hugely entertaining comedy that will have you both laughing and singing in the aisles. 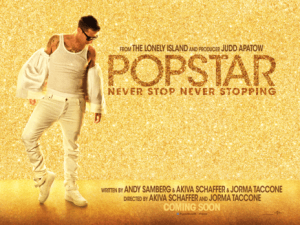 Popstar: Never Stop Never Stopping is a consistently hilarious dig at the modern music industry by The Lonely Island trio, who not only point out the serious problems with ego and pride with certain musicians nowadays, but also seem to have a genuine affection for what they are satirising, something that comes across in their ever-reliable music contributions.